The Swarovski Optik CT 101 Carbon Fiber Tripod is the perfect lightweight tripod (4.5 lb, 2.1 kg) designed for frequent and intensive use out in the field. It comes with the DH 101 Tripod Head which together provide secure and stable support for your spotting scope, digiscope, or rifle scope. The CT 101 and DH 101 reach a working height of 71.7" (182cm) and will provide you with a stable base for your equipment under even extreme weather conditions. The DH 101 features Swarovski's Fast Mount System (FMS) for getting your scope on and off the tripod head easily with just one hand and both axes can be set with a single movement. It has a five-tooth locking system which prevents upward or lateral displacement for considerably less movement after setting and greater stability. The integrated leveler aids in positioning and its rubber feet with retractable spikes make this tripod ideal for providing a stable support on any terrain. If you need a lightweight tripod that can stand up to extreme conditions and is also extremely comfortable to carry, then this tripod is the one for you. The carbon fiber tripod CT 101 is not only extremely rugged, but with the DH 101 Tripod Head attached it also offers a viewing height of 71.7" (182cm) and weighs just 4.5 lb (2.1 kg). A Swarovski Optik spotting scope offers you high optical quality, sophisticated performance, and innovative design. To use all these benefits to their best advantages, it is important that your spotting scope has firm legs to support it and is mounted in a way that allows you to use it quickly and easily. 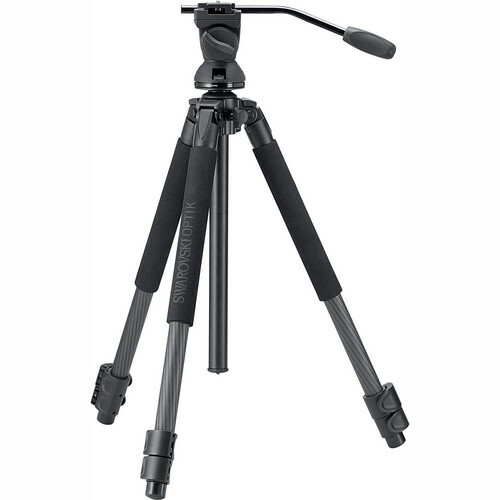 The CT 101 carbon fiber tripod and the DH 101 tripod head are tailored for frequent and intensive use. The DH 101 tripod head features a redesigned clamping system with an 85% improvement in rigidity over the previous Swarovski FH 101 tripod head. In addition to a lightweight and rugged design, the equipment is quick to adjust and comfortable to carry. A soft and rugged neoprene shoulder pad and carrying strap allows the tripod to be carried comfortably. Ergonomic quick-release fastenings are smooth, comfortable to use and almost soundless. With its exceptional positional stability, the tripod head DH 101 provides the perfect conditions for observing and digiscoping. The spotting scope is automatically secured to the tripod head to avoid the accidental release of the spotting scope - for maximum safety. Using the Fast Mount System (FMS), the spotting scope can be mounted quickly onto the tripod head with just one hand. Both axes can be set with a single turn of the hand. The tilt and pan movements can also be adjusted and set individually for comfort and ease of use. The integrated leveler makes it easier to adjust the tripod. The outstanding positional stability also prevents even the smallest movements while observing or digiscoping.